The Sunset Triangle Plaza bike corral contains six of our popular bicycle shaped racks, comfortably accommodating up to 12 bicycles. The corral is located on the southern portion of the Plaza. Businesses surrounding Sunset Triangle Plaza, including Morning Nights (great coffee!) and United Bread & Pastry (great little empanadas and more! ), as well as the bi-weekly Farmers Market, will stand to benefit from the additional bicycle parking spaces that the corral will provide. This area is particularly well suited for a bike corral due to high existing bicycling demand and constrained sidewalks. For more pictures of the bike corral and the installation process, see our Flickr set. 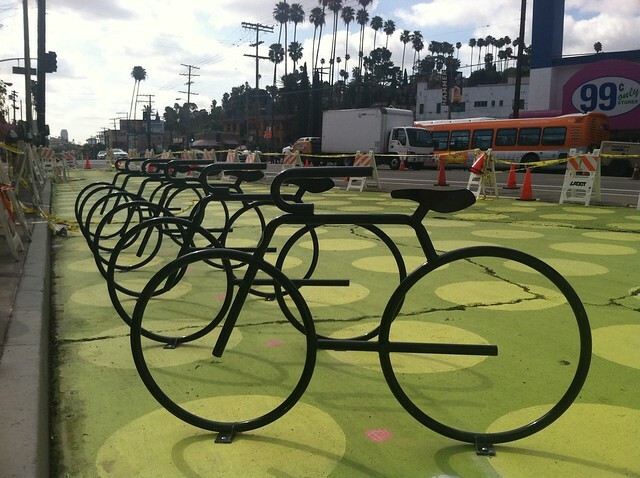 Silver Lake’s new bike corral is the second project to come to fruition from our Bike Corral pilot expansion. 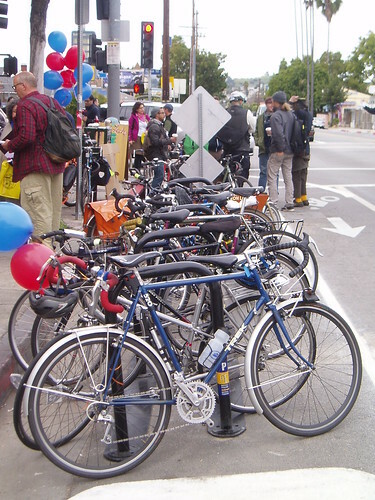 We are still looking for potential locations throughout the City of Los Angeles for additional bike corrals, so be sure to submit your ideas/suggestions in the comments section below or through our interest form. Hopefully people understand what they are for–I’ve seen some people pass over decorative bike racks like this, thinking that they’re sculpture or that they weren’t supposed to use them. Sad, but true. And can I suggest a corral for Westwood Village? I think a spot on Broxton would be ideal. Silver Lake’s corral is much better than the 1st one in Highland Park. Nice aesthetic and a huge leap in visual appeal from our crude beginning. It was absolutely ridiculous how many barriers the bureaucrats threw at our friends at Cafe de Leche. So it was a HUGE WIN just getting the DOT to do one in the first place. So glad the design is evolving, just like the City’s attitude towards bike culture. Are the theme racks supposed to distract people from the unfilled and very visible cracks in the street? 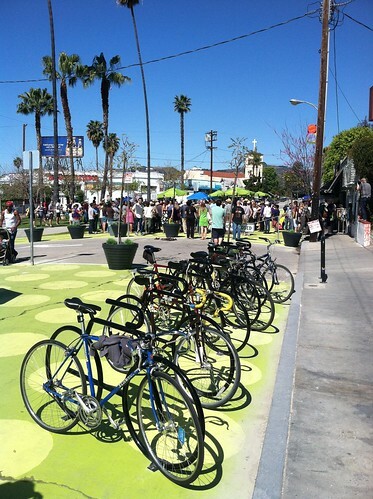 Isn’t there another bike corral near Santa Monica and Vermont? At least, I seem to remember passing six U-racks in a small stretch of sidewalk there, but perhaps that’s classified differently. At any rate, it’s great that there’s getting to be better parking in all these areas! Bike Corrals are on-street bike parking facilities. We only have two corrals right now at Ave 50 and York, and at the new Sunset Triangle Plaza. Thanks! We hope to have more corrals in the not so distant future!